Lately, knitting and blogging have taken a back seat to other stupid mindless time wasters hobbies like crossword puzzles, Scrabble and Boggle. Is it knitting-related to play Scrabulous and Scramble with other knit bloggers on Facebook? In any case, I have been terrible about checking in with all of you so I hope to get back on track this week. 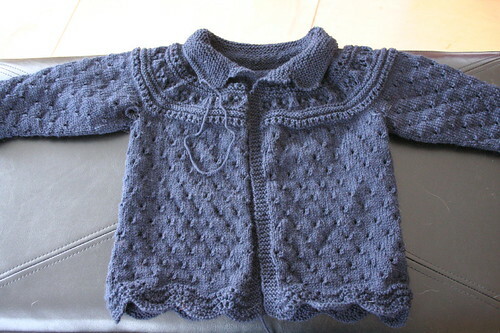 In the meantime, I have been knitting and sewing a few projects for Beatrix, as I mentioned in my last post. 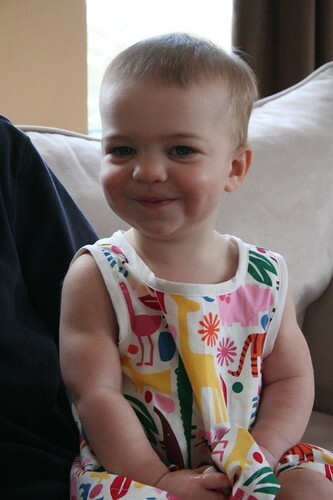 I promise not to turn this into a baby clothing circus blog – that is, sock knitting will return next time – but the kid needs some sweaters and sun dresses make summer diapering and swimming so much easier that I can’t resist the temptation. This expression is Beatrix for “ICK! WOOL IN SPRINGTIME! TAKE IT OFF NOW!” She was particularly uncooperative so this is the only picture you get. 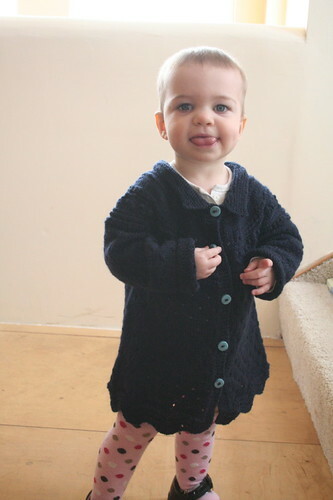 I will probably try again next winter when it fits her (and also when it’s not so hot out). 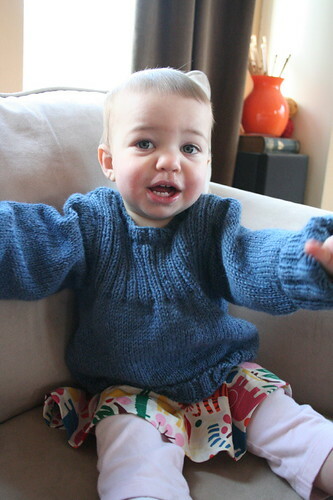 As with all Phildar baby patterns, this was super easy and the seaming took nearly as long as the knitting. I made the usual modification of picking up stitches for the neck and button bands instead of knitting them separately. Last week, I made some progress on the little cardigan but I need to rip and re-knit one of the fronts so we are not on such great terms right now. The yarn in Classic Elite Cotton Bam Boo, which has great stitch definition but could probably pass for Knit Picks Shine Sport. 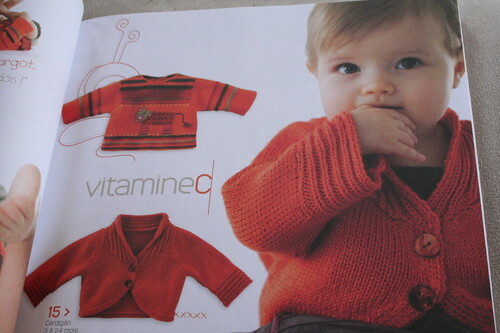 While I like this yarn for a baby sweater, I cannot imagine knitting one for me with it – I would expect an adult sweater to lose its shape quite quickly. 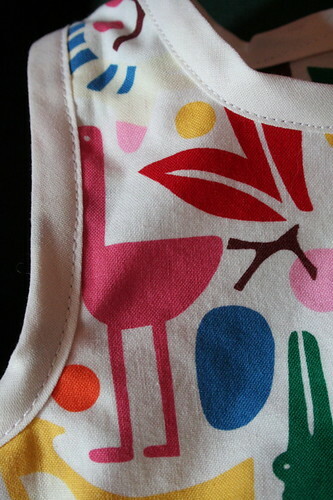 Finally, have a peek at the toddler sewing projects! 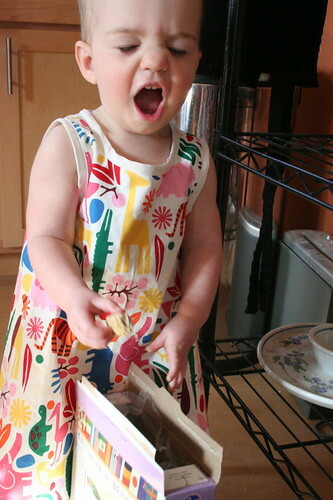 I am making several dresses for B, all from the same, very simple pattern (Butterick B4712). Here is the first one. I am using extra wide, double-sided bias tape for the neck and armholes because my seaming is pretty ugly there. Fortunately, bias tape hides everything. Not until I uploaded this photo to Flickr did I see the near perfect stitching here. Please believe the rest of the garment looks like that! No? Would you believe most of it? OK, some of it and we’ll leave it at that. 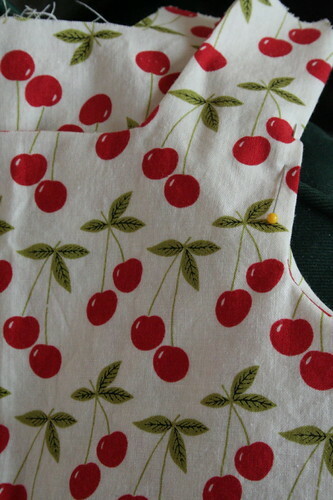 Finally, this is the next one in the queue, all cut and pieced but missing a zipper and some top-stitching. That’s it for this edition of the baby blog. 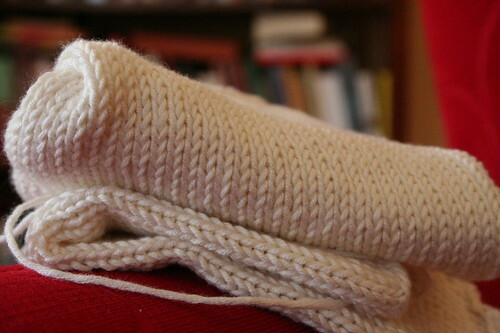 Tune in next time for some finished Latvian socks! I know it’s been weeks since I checked in but I’ve been terribly distracted by spring and all the hope it brings. I am giddy, full of ideas and furiously planning for the summer. 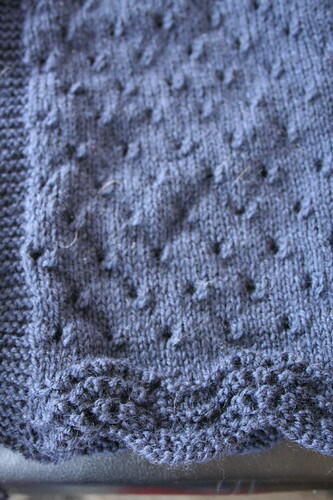 Furthermore, my knitting has not excited me much so I’ve had little blogging to do. 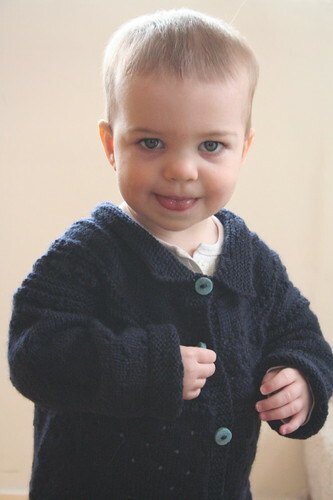 The end of winter absolves me of my nagging guilt over not knitting anything for Beatrix this year; instead, I am now liberated to knit her a few sweaters for next winter. Modifications: I omitted the crochet edgings on the collar and cuffs. 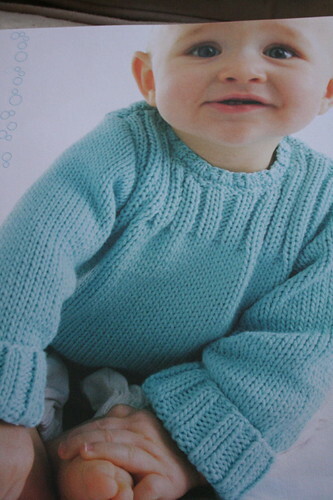 I wanted a navy sweater but I regret that the color quite obscures the pattern. I’ll know better next time. The photos below are more accurate representations of the color. Tune in next week for more complete updates!